Here we are, then. Nuclear #Spiceawar goes down tomorrow, 2:30pm, at Saranac. You already knew that, though. 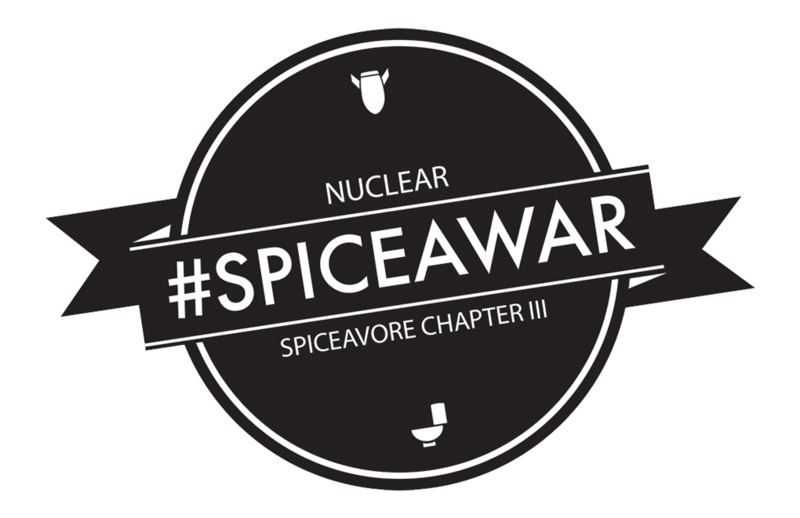 Just for funsies -- because we are nothing if not fun -- we've come up with a hashtag for those who want to do #Spiceawar selfies. Because who doesn't want to do that?! Add #spiceawarselfieclub (just a little something we came up with) either in Instagram or Twitter, and you could become famous (except you probably won't be). Now, how about the rounds? What will you witness, and possibly partake in? #1: The Spokane Special: A mild start with some Spokane-inspired classics. A burning hot slice of pizza paired with a shot of Frank's, and a shot of ranch. It all goes down easily, but the burn of the pizza is slow, and will make itself known sooner rather than later. Bonus Round: Punch Box of Perturbation: The winner of the first round can go to the box, or choose another competitor to do so instead. With twenty choices, the box can reveal both wonders and catastrophes for the player. It's a gamble, but possibly, maybe one worth taking. #2: Substitute Subs: A flaming hot sub from Spike's, and a shot of habanero aged Fireball whisky to wash it down. For those who had the displeasure of drinking something similar before, you will know that the relatively mild habanero can do true damage when combined with hard liquor. #3: Santevore: A secret dish -- or possibly drink? -- from Santé and the Butcher Bar. From what we know, it will be inhumanely hot, particularly when paired with a juice from BEET It Up. This will be the round where the pros will truly be separated from the amateurs. #4: A Trifecta of Sweetness: Spiceavore fans will know the Dave's infused Peeps are the nastiest combination known to man, and they're back. They will be accompanied by the devil's tort, and a particularly spicy Brain Freeze ice cream. Bonus Round: A secret one at that: What happens here? You will find out soon enough. Bonus Round: The Loser's Punch Box of Perturbation: Here the third place contestant can choose if they want to go to the box themselves, or send one of the two other competitors in their place. A strategic maneuver, and one that needs to be properly thought out. #5: The Saranac Three: This is where it all will go down. What is the Saranac Three? Sliders. But not just sliders: sliders of death. And the winner of that round will be the ultimate Spiceawarrior! Of course, there is more to it. The audience -- you -- can go to the Punch Box of Perturbation. You might win prizes; you might bestow horribleness on a player of your choice; you might give a player an upper hand. That's it. Tomorrow. 2:30pm. Saranac. You would be a horrible person if you missed it. Do you recommend Introducing Nuclear #Spiceawar's Five Rounds of Horribleness? Make your voice heard!